Open the Stream2 app. 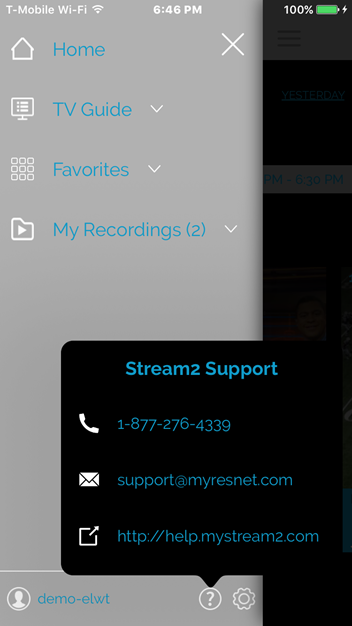 Go here to see in detail the login process for the Stream2 app. 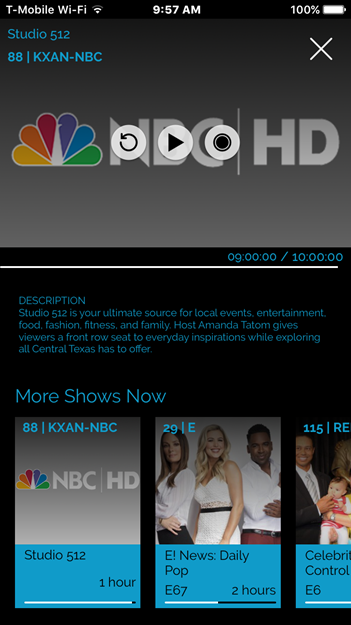 After installing and launching the app, you will be presented with the Stream 2 Home Screen. 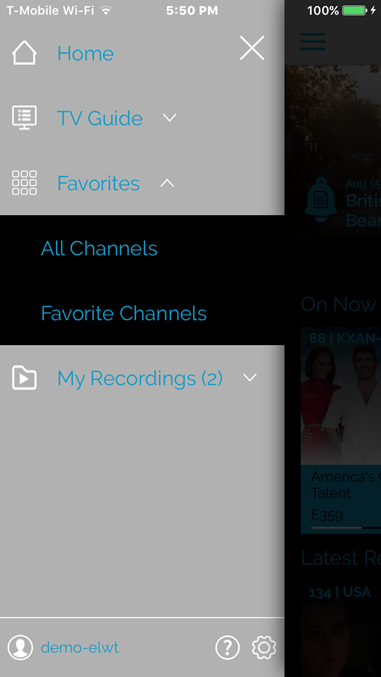 Here you can access your menus, select a show from the TV guide, or browse your most recent recordings. This is your Stream2 home screen. 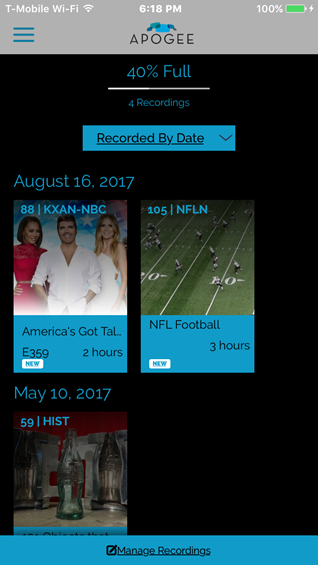 Here you can access the menus, TV Guide, and most recent recordings from your DVR. To access your menus, tap on the three bars in the upper-left corner of your phone screen. 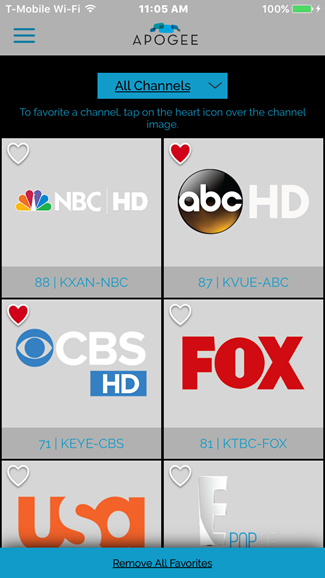 Tap on the TV guide to access all channels or specific programming under various categories. 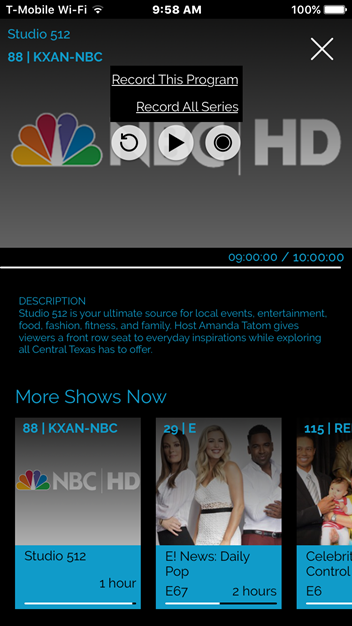 Once you tap on a channel to select it, you will be taken to the summary of the current show airing in that timeslot. Here you can play from the beginning of the episode, play from its current live on-air time, or record the show. 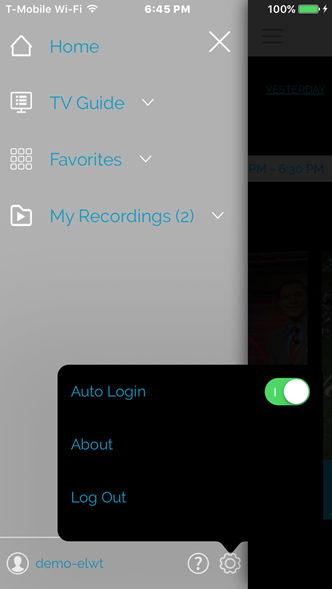 To record a show to DVR, you can press the circular “Record” button on the right. This will give you the option to record the entire series or the single show airing. You can also do this from within the player. In the bottom left of the screen you have the Startover, Rewind, Pause/Play, Fast-Forward, and Record buttons, respectively. 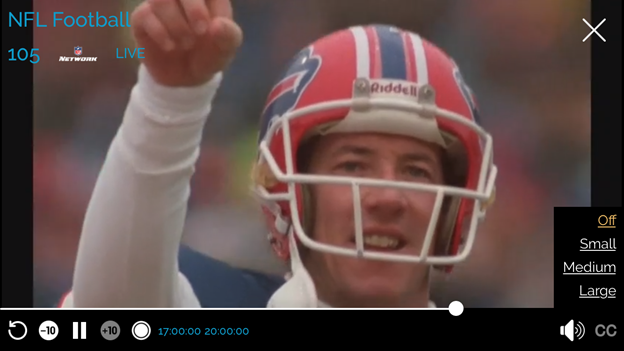 You can also scrub the time stamp back to an earlier time in the video by tapping the time marker and sliding it back to a desired part. 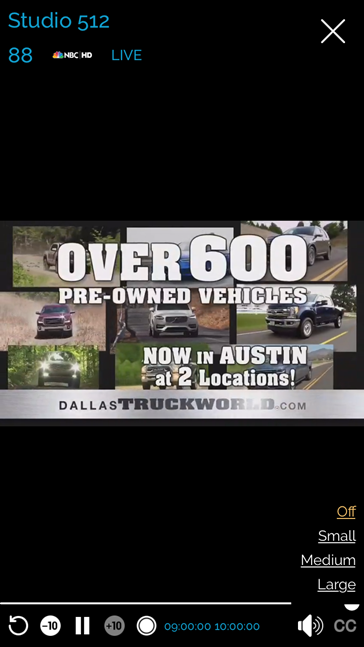 If the show is airing live, however, you cannot scrub forward. 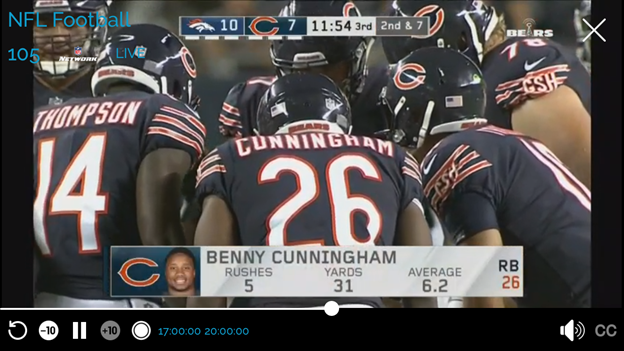 To access closed captioning, tap on “CC” in the bottom-right corner of the screen. You can close out of your current view by tapping the “X” button in the upper-right corner of the screen. You can also access your favorites in the Main Menu. 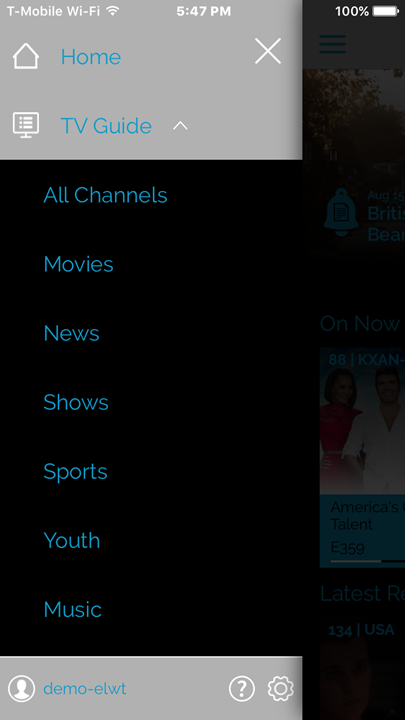 This is where you can identify channels you frequently watch for ease of access while browsing. 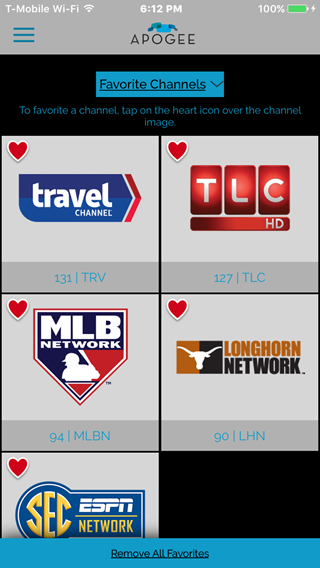 To view all channels and select or remove favorites, select “All Channels” and then tab the heart on the channels you wish to select. You can also access your favorites by selecting “Favorites” in the Main Menu or in the drop down menu. 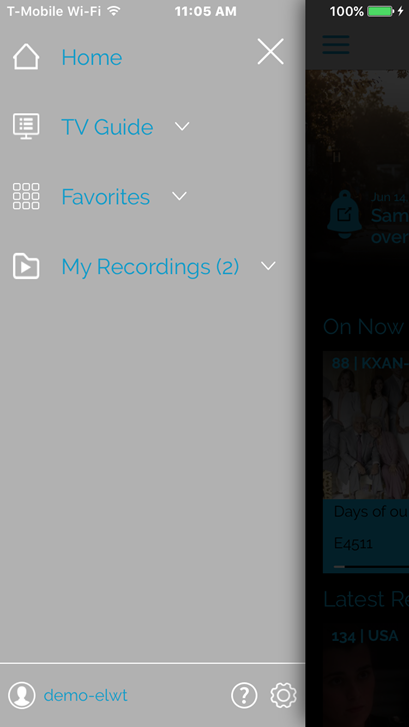 You can access and manage your Recordings Library in the Main Menu. 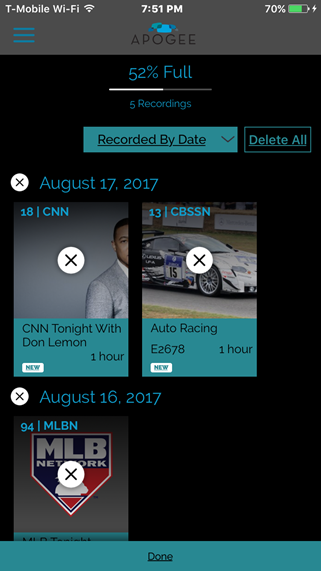 Here you can sort, view, or manage your recordings. 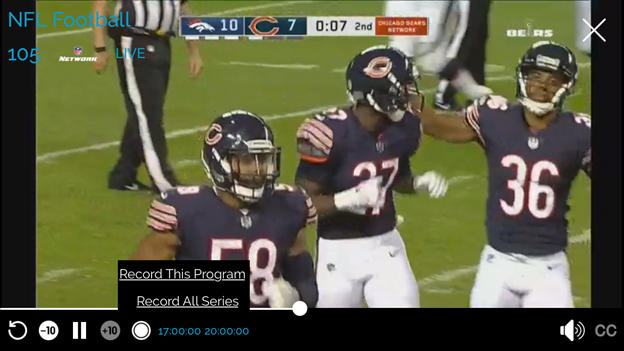 To view a recording tap the recording you wish to watch and play it like you would a live video. 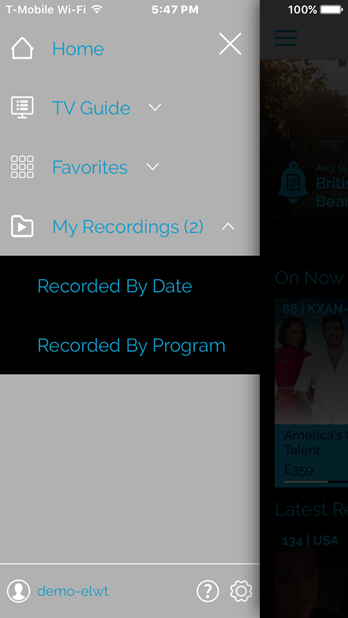 To Manage your recordings, tap on the “Manage Recordings” button on the bottom of the screen. To delete a recording tap on the “X” over the recording you wish to delete and tap “Done” when finished. You can access support by tapping on the “Help” icon in the Main Menu. This will display your school’s Stream 2 support phone number, e-mail address, and a shortcut to this Help website. To log out of your account or set your application to log in automatically upon launching, access the Settings menu by tapping the gear icon in your Main Menu. This is also where you can determine your app version number for troubleshooting.